The Los Angeles Rams defeated the Oakland Raiders on Monday night, 33-13, concluding the first week of the 2018 NFL regular season. Quarterback Jared Goff didn’t have the best night in terms of accuracy, but it’s clear that Goff and head coach/play-caller Sean McVay seem determined to stretch the field. Wide receiver Brandin Cooks was heavily targeted throughout the game and looks to be the focal point of the Rams’ passing offense. Running back Todd Gurley barely came off the field, which shows just how important he is to the Rams’ offense. Throughout the game, Gurley displayed his normal burst and athleticism with the ball in his hands. 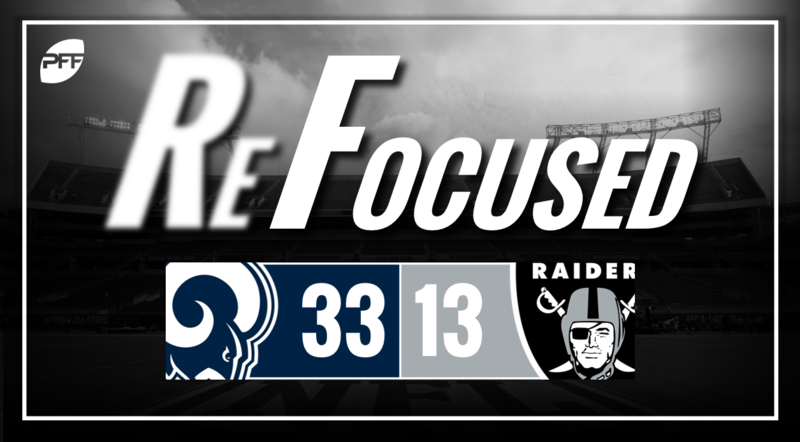 The Rams talented defense showed up in a big way, forcing three turnovers and producing numerous pressures on quarterback Derek Carr. Aaron Donald was at the forefront of it all and consistently got the better of Raiders right guard Gabe Jackson. The two new additions in the secondary, Aqib Talib and Marcus Peters, limited Jordy Nelson and Amari Cooper to a combined 4 catches for 32 yards. If they can continue the same kind of dominance against opposing receivers, this defense will quickly become a nightmare to face up against. With Jon Gruden returning to the sideline as their Head Coach, it was a night of miscues for the Raiders. They turned the ball over three times on offense as quarterback Derek Carr threw three interceptions. His second interception in the middle of the fourth quarter took all the wind out of the sails, as they were driving to make it a one-score game. Veteran tight end Jared Cook had a great game, his only miscue seemed to be late in the game when he stopped on a crossing route, leading to a pick-six for the Rams. Cook ended the night with nine catches for 180 yards, with a chunk of that yardage coming after the catch while he dragged defenders behind him. The Raiders defense wasn’t able to generate a consistent pass-rush all game. After Khalil Mack‘s defensive display on Sunday night, it’s become apparent that the Raiders will miss his services this year. Bruce Irvin had the play of the night for the Raiders’ defense, as he stayed after his rush and was able to strip the ball away from quarterback Jared Goff, who had held onto the ball for too long in the pocket. Los Angeles: The Rams offense hit their stride in the second half and were able to rip off some long scoring drives and drain the clock. Oakland: Oakland turned the ball over three times and were penalized 11 times for 155 yards. That’s not a formula for success.